Nordic Bar | Pub Quizzers | Find a pub quiz near you, now. 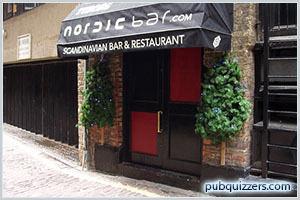 Pub quizzes take place at Nordic Bar, Fitzrovia on Tuesdays (fortnightly) at 18:30. Entry is £0.00, you can have up to 7 people on a team. There are prizes of cash. Happy quizzing! Get ready for another Nordic Pub Quiz in collaboration with Rocking Roos. Expect all sorts of video and music based rounds with your team singing their hearts out for victory. With prizes from 1st to 3rd place you won’t want to miss out! Book your team with us now. There is 1 comment about this quiz.